An import quota is a limit on the amount of imports that can be brought into a particular country. For example, the US may limit the number of Japanese car imports to 2 million per year. Quotas will reduce imports, and help domestic suppliers. However, they will lead to higher prices for consumers, a decline in economic welfare and could lead to retaliation with other countries placing tariffs on our exports. Absolute quota – a simple physical limit on number. 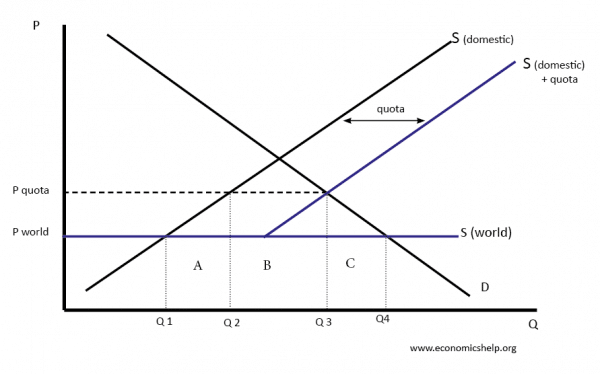 Tariff rate quota – These allow a certain number of imports to gain a discount on the usual tariff rate. Voluntary export restraints (VER) This is when a government limits the amounts of exports from one country to another for a particular type of good. In the early 1980s, there was a VER on exports of Japanese cars to the US. The cap on export of Japanese cars lasted from 1981 to 1994 because the US government wished to protect the US car industry. Domestic suppliers gain more revenue. The price rises to P quota and domestic suppliers, supply more Q1 to Q2. It can create domestic jobs. Consumers pay a higher price and also total quantity falls from Q4 to Q3. Governments are not affected directly, as there is no income. There is a net welfare loss to society because the increase in producer surplus is outweighed by the decline in consumer surplus. World exporters will make less revenue – unless demand is very inelastic, meaning increase in price is greater than fall in quantity. 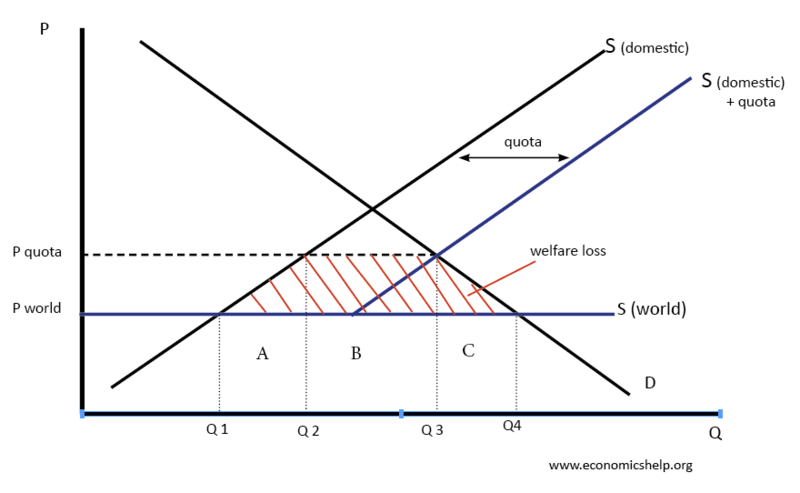 Red shaded area is welfare loss of quotas. Quotas tend to cause a bigger fall in economic welfare because the government don’t gain any tax revenue, that you get with tariffs. 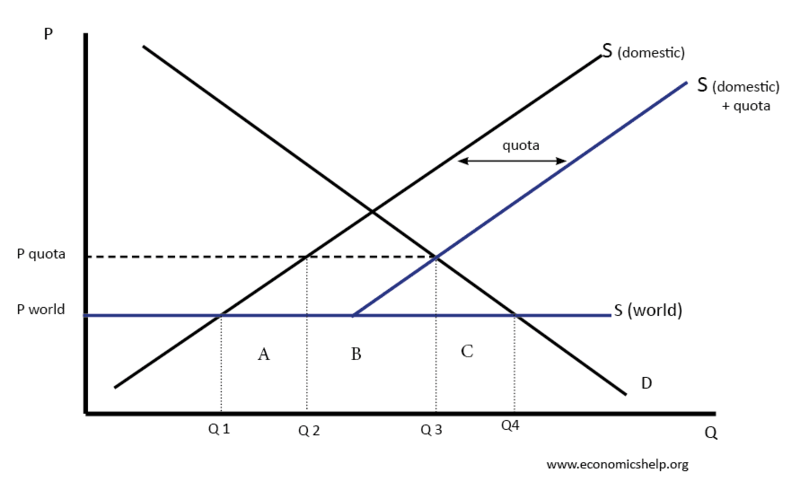 Quotas allow the country to be certain on the number of imports coming in. Tariffs is more unknown because it depends on the elasticity of demand and how consumers and suppliers react to the tariff. Quotas may be harder to enforce if it is difficult to count the amount of the good coming into the country.